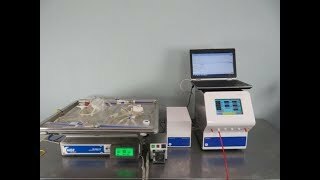 The GE Wave Bioreactor model 20/50EHT is a flexible design built ideal for cell culturing, protein manufacturing, CHO cells, vaccination production along with various applications. This modular design consists of a base rocker and various integral options suitable for culture of multiple cells lines. This Bioreactor works with patented wave cellbags and come in 20 and 50 liter sizes. This bioreactor can come with a lid to safeguard the Wave Cellbags from getting punctured while in operation. This GE Wave Bioreactor model 20/50EHT comes with a Converter 100 controller unit, designed to provide an interface hub between the bioreactor and the UNICORN DAQ software. The Converter 100 features a standardized serial fieldbus that’s optimized for process automation. This bioreactor also comes with the Wavepod II CO2 O2 PHOPT DOOPT II that integrates dissolved oxygen measurement, pH measurement, and CO2/O2 gas mixing into one device for complex control schemes, as well as a pH probe, and DOOPT probe and a CO2 line in. This bioreactor is also outfitted with a Pump20-R peristaltic pump for use in feed/harvest for acid and base additions. The WAVEPOD II helps your bioreactor meet individual cell culture requirements for mammalian cells, insect cells, cell therapy or profusion. This GE Wave Bioreactor 2050EHT system has been flly tested and is ready to go, please note disposable reaction bags are not included. All of our lab equipment comes backed with our standard warranty. Should you have any questions please don't hesitate to contact us.